Bridging contemporary and classic design, the Lily Stacking Chair is truly the best of both worlds. Change your perception of practicality with our contemporary perforated seat stacking chairs. 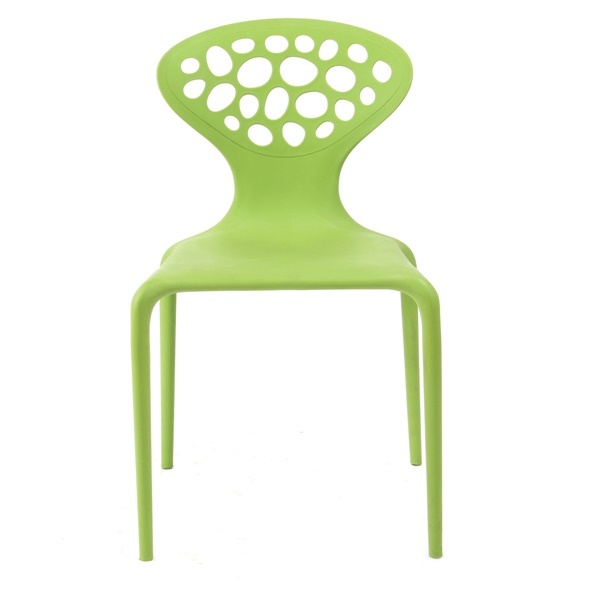 The Lily Stacking Chair is proof that simple shapes can make a big impression. With the Lily Stacking Chair you get a high quality chair with a unique aesthetic and superior, comfortable support. The Lily Stacking Chair conveniently stacks for easy storage when not in use. These made the PERFECT chairs for our bubble tea cafe - cut-out circular shapes on the backrest, quirky shape and stacking feature plus price point - these chairs are the total package!! Cool cut-out backrest, shape is rare - they have an artistic style about them, i like them a lot! What a fun and interesting design! I ordered in green and the color really stands out in my kitchen in a good way. Impressed with the overall look and quality! unique, comfortable, sturdy, love the cut out back! thank you x1000! Purchased these chairs in green and they look great! Design is unique and they are very useful for when guests come over, overall satisfactory buying experience. Ordered these in white as extra seating for company. They are easy to clean and stack so I can store them easily. Can't beat the price! Thanks Inmod!! Does the Zuo Mod Lily chair look exactly like the Zuo Mod Mazipan chair?I know there's a slight different in dimensions, but other than that, are they actually the same chair? The Lily Chair from our Inmod Signature Collection does have a slight difference in dimensions [Lily Chair: 18"w x 20"d x 32"h, 18"seat height -- Marzipan Chair: 19"w x 19"d x 32"h, 18"seat height], however it is very similar to the Marzipan Chair. The Lily Chair can also be ordered in increments of 4, while the Marzipan Chair will need to be ordered in increments of 6. If you're not looking to match already purchased Marzipan Chairs, the Lily Chair is a fantastic product of equal quality for an even more affordable price.